Over the weekend, under quiet negotiations, Governor Brown, Democratic leaders, and SEIU-UHW reached a swift agreement, without business input, on increasing the state’s minimum wage to $15 per hour by 2022. You will recall in 2013, a similar deal was struck and Governor Brown agreed to raise the minimum wage with no future increases tied to CPI if labor groups would not pursue an initiative on the 2014 ballot. Governor Brown signed AB 10 in September 2013 to raise California’s minimum wage 25 percent, from $8 to $10 per hour, effective January 1, 2016. In Governor Brown’s budget proposal this year, he cautioned against any additional minimum wage increases because of a $4 billion per year increase in state expenditures and warned of the need for remedies in case of economic recessions. However, in a press conference earlier this week, Governor Brown and legislative leadership discussed the positive impacts raising the minimum wage will have on millions of Californians and how the agreement will help clear the saturated ballot come November. Proponents of the agreement argue that it offers flexibility by allowing a “pause button” in the case of potential future deficits and removes an initiative from the ballot. As you know, SEIU, the proponent of the agreement, has been collecting signatures for two different minimum wage initiatives that qualified for the November 2016 ballot. SEIU has stated they will remove their initiative after and only if the Governor signs this legislation. 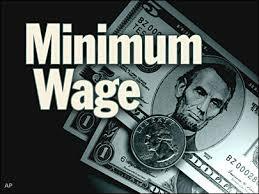 Earlier this week, the agreement was put into print in Senator Leno’s minimum wage bill from last year, SB 3. SB 3 allows small businesses to have a one-year implementation delay and provides 3 paid sick days to IHSS workers gradually until 2022. The Governor may notify the legislature to temporarily suspend increases when there is a deficit (option may be used only twice) or a deficit is determined by adjusted EDD employment data and sales and use tax cash receipts. Since it’s amendment earlier this week, the bill has been fast tracked through the Legislature. SB 3 passed out of the Assembly Appropriations committee earlier this week and off the Assembly Floor today where it was then immediately transmitted to the Senate. In the Senate, due to rule waivers, SB 3 flew through the Labor Committee and passed off the full Senate Floor. Governor Brown has announced he will sign SB 3 (Leno) on Monday, April 4, 2016 in Los Angeles.